We are always looking to add real talents to our practice. JOIN OUR FUN, VIBRANT & PROFESSIONAL TEAM TODAY! 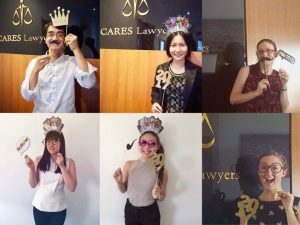 CARES Lawyers is so much more than a law firm and working at CARES is so much more than a job. A caring culture coupled with a strong team environment, where all members of staff, support each other and work collectively towards achieving great results for our clients. In addition of having ridiculously awesome work/life balance, we pride ourselves on being caring, friendly and approachable. We love what we do and this evidently reflects the quality of our work and the great relationships with our clients. Would you like to be a part of this very culturally diverse team? Would you like to work in a supportive environment where you have the opportunity to develop your full potential? Would you want to be part of this great family to make a real difference to the clients, the community & the society? Would you see yourself fitting in with this culture with the main focus on bettering ourselves to make greater contributions to the community and advocating for fundamental human rights? Will CARES Lawyers be your platform for greatness? We are always looking for new opportunities and for the “right” people to join CARES’ journey.